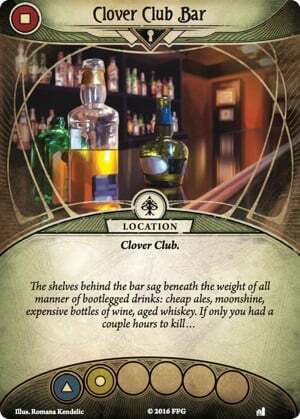 Arkham Horror: The Card Game has sunk it’s mind-shredding claws into my gaming group. Here at BoLS, we got to do an unboxing of the core set that you’ll get to check out later today. 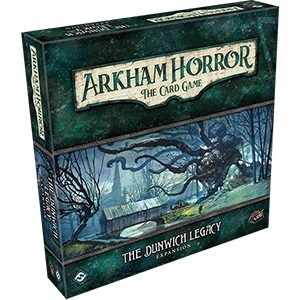 For now I wanted to take a moment to share some news about the Deluxe Expansion that’s going to make it’s way to stores shortly – The Dunwich Legacy. I’m sure some folks are wondering “why are they doing them out of order? Shouldn’t they introduce the core set first?” Well, the core set has been out for a bit and it’s recently been re-issued. So while it’s not technically a new game, it may feel like it’s new. 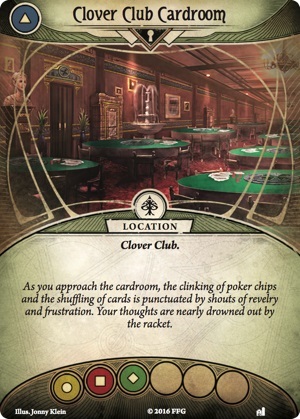 Plus, doing it out of order seems very “Arkham Horror” appropriate…if you’ve played the game you know exactly what I mean. Strange Solution, to me, is really what this game is all about. 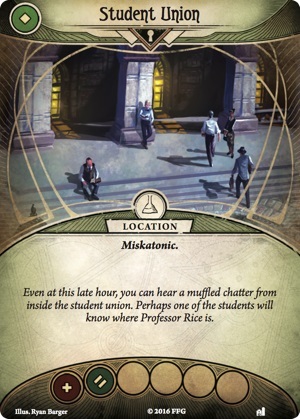 It’s a Seeker class asset card – not an event card or a card even directly tied to the story…at least not yet. As of right now, this card actually has no discernible purpose. 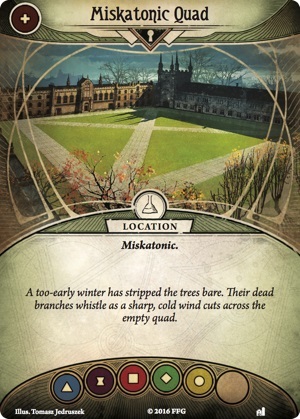 “So why would you include this in your deck?” Because it’s tied to the Campaign Log – the thing that makes Arkham Horror one of the most unique LCG games out there, in my opinion, and what makes this game so good. You see the Campaign Log is what you use to keep track of your progress. As you play the game you will either succeed at the scenarios or you’ll fail. Sometimes you’ll REALLY fail and get the worst possible outcome. But those success and failures actually matter in terms of what happens next. Your actions have long term effects on the overall game state! Arkham Horror The Card Game blurs the line between RPG and Card Game. If you play the game how it’s supposed to be played and you don’t read ahead it’s much more rewarding than figuring out which outcome you want and then playing for that goal. This card – Strange Solution – is card that highlights this concept. Will you include it in your limited deck pool in hopes of identifying the solution for some added benefit in the future? Or will you skip over it and hope that it didn’t matter in the long run? It’s a card that acknowledges the meta game and totally screws with it at the same time. That’s what makes this game unique and I am still trying to wrap my head around it! In their second preview of this deluxe expansion, FFG showed off some of the new locations and other cards you’ll come across. 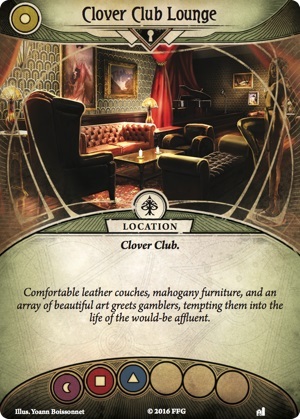 This expansion features two prominent areas: The Miskatonic University and the Clover Club. These locations will undoubtedly hold new secrets to uncover to further your investigation. That’s another part that makes this game so interesting – you can choose which location you want to explore and which order you want to explore them in! Why does that matter? Because if you’ve played the core game you know what that implies. 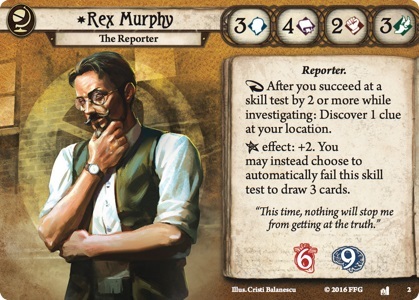 You see, as you play your investigator you gain experience and you spend that experience on card upgrades. But you can also take trauma to your investigator – that mental or physical damage carries over from game to game. You might end up stronger for your side adventures, but you might also end up crazy or crippled physically. Again, with this game your decisions matter. Rex Murphy is a bit of a book worm but his ability to uncover clues could be very welcomed on the mind-bending streets. 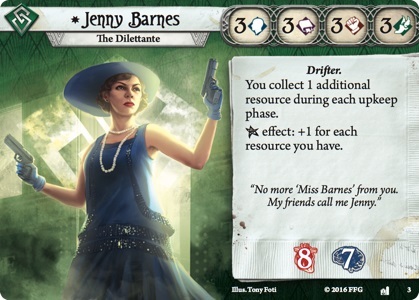 Jenny Barnes is one of the most balanced characters you could hope for – but while she might not have any overt weakness in her stat block, she doesn’t really excel at any one skill either. Personally, I’m really looking forward to this expansion. 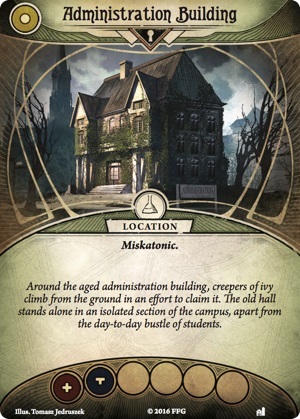 The narrative experience of the Arkham Horror card game’s campaign really lends itself to these type of expansions. Couple that with player choices that really matter with long term impacts, the intense card game mechanics and co-operative game play I’m really hooked on this game. If you get a chance to play Arkham Horror give it a shot! Once you get hooked go pick up The Dunwich Legacy and take on the campaign from another angle. Can you survive the Dunwich Legacy?